Strengthen your understanding of Christianity and get practical insight into different faiths so that you can be a more effective witness. Paul Carden is executive director of the Centers for Apologetics Research (CFAR), and author of Christianity, Cults & Religions. He is also former co-host of the nationwide “Bible Answer Man” radio program. 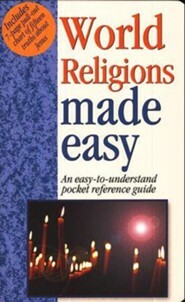 From Islam and Judaism to Jehovah's Witnesses and Mormonism, quickly get a handle on 30 different belief systems and how they compare to Christianity with this pocket-sized book! 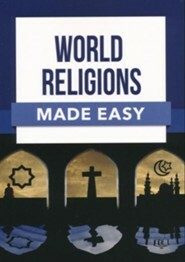 Packed with clear overviews of world religions, such as Christianity, Hinduism, Buddhism, and Islam, World Religions Made Easy also compares the key beliefs of each. With billions of people around the world believing in a religion other than Christianity, it is important to understand what they believe, how it compares to Christianity, and how to address common misunderstandings. Paperback, 96 pages, 6.5"x 4.5". Perfect for individual and group study, church libraries, Sunday school classes, missionaries, and more! Some belief systems use similar terms, such as salvation and even Jesus, but define them in a totally different way. Strengthen your understanding of Christianity and get practical insight into different faiths so that you can be a more effective witness. Solid and Up-to-Date Research. Researched by one of the top apologists and scholars in the field, this quick handbook was compiled by expert Paul Carden, executive director of Centers for Apologetics Research (CFAR), author of the Christianity, Cults & Religions Pamphlet (over 1 million sold!) and former co-host of "Bible Answer Man" radio program. Easy-to-Read and Scannable. With colorful sidebars and pull outs, it's easy to see dozens of facts at a glance. Highly Visual and Illustrated. See over 100 full-color pictures making it easier for you to understand each religion's beliefs, symbols, places of worship, founders, key texts, and more. Short and Concise. 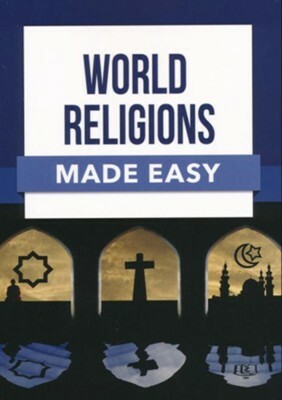 Includes brief summaries of the beliefs and basic history of 30 world religions, sects, cults, and new religious movements. Fascinating Facts. Packed with interesting insights such as: "Jehovah's Witnesses believe followers must earn their salvation;" "80% of India practices Hinduism;" "Freemasons read the 'Masonic Edition' of the Bible." Addresses Common Misconceptions. Includes a side-by-side chart that shows what other religions teach and how their beliefs compare to what the Bible teaches. Key verses included. Paul Carden is executive director of the Centers for Apologetics Research (CFAR), and author of Christianity, Cults & Religions (over 1 million copies sold!) He is also former co-host of the nationwide “Bible Answer Man” radio program. I'm the author/artist and I want to review World Religions Made Easy.